Hailed by The New York Times as a pianist of "a fiery sensibility and warm touch", Anna Shelest is an international award-winning pianist who has thrilled the audiences throughout the world. 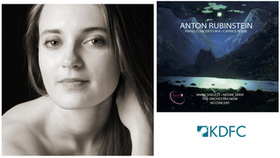 Champion of esoteric repertoire, Anna is collaborating with the legendary conductor Neeme Järvi on a project of recording complete works for piano and orchestra by Anton Rubinstein. The first CD in the set featuring Rubinstein Concerto no. 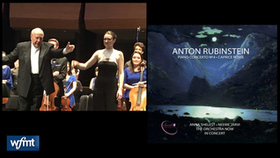 4 and Caprice Russe recorded live at Lincoln Center's Rose Theater in New York City has been released in 2018 to great critical acclaim. The next release featuring Rubinstein Piano Concertos No. 3 & 5 with Estonian National Symphony Orchestra is set for release in early 2019. An "effective collaborator" (The New York Times), Anna made her orchestral debut at the age of twelve with the Kharkiv Symphony Orchestra, playing Rachmaninoff's Piano Concerto No. 1. Since then she has been a soloist with some of the world-class orchestras such as Montreal Symphony, Cincinnati Symphony under Paavo Järvi, St. Petersburg Philharmonic, and Estonian National Symphony, among others. Over his long and highly successful career Neeme Järvi has worked with the most prestigious orchestras, including the Berlin Philharmonic, the Royal Concertgebouw in Amsterdam, the Bavarian Radio Symphony, Leipzig Gewandhaus, the Czech Philharmonic, and the Vienna Symphonny, in addition to the major U.S. orchestras including the New York and Los Angeles philharmonics. He also continues regular relationships with the NHK-Tokyo, Shanghai, and Singapore symphony orchestras as well as the Bergen Philharmonic Orchestra, Gothenburg Symphony Orchestra, and the Royal Scottish National Orchestra (RSNO). Mr. Järvi has held positions with orchestras across the world. He is currently artistic director of the Estonian National Symphony Orchestra and music director emeritus of both the Residentie Orchestra (The Hague) and the Detroit Symphony Orchestra. He also is principal conductor emeritus of the Gothenburg Symphony and conductor laureate of the RSNO. He was artistic and music director of the Orchestre de la Suisse Romande until the summer of 2015, and ended his tenure with a European tour. Mr. Järvi has recorded with Chandos Records for over thirty years, and recent releases include Tchaikovsky's complete ballets with the Bergen Philharmonic; symphonies and other orchestral works by Swiss Composer Joachim Raff; and music by Massenet, Chabrier, Saint-Saëns, Atterberg, Suchon, Ibert, Xaver, and Scharwenka. Highlights of his extensive discography include critically acclaimed complete orchestral cycles of works by Prokofiev, Shostakovich, Richard Strauss, Mahler, Dvořák, Glazunov, Grieg, Sibelius, Nielsen, and Brahms. Throughout his career, he also has recorded with such labels as Deutsche Grammophon, BIS Records, and EMI. The Orchestra Now (TŌN) is a group of vibrant young musicians from across the globe who are making orchestral music relevant to 21st-century audiences. They are lifting the curtain on the musicians' experience and sharing their unique personal insights in a welcoming environment. Hand-picked from the world's leading conservatories-including The Juilliard School, Shanghai Conservatory of Music, Royal Conservatory of Brussels, and the Curtis Institute of Music-the members of TŌN are not only thrilling audiences with their critically acclaimed performances, but also enlightening curious minds by giving on-stage introductions and demonstrations, writing concert notes from the musicians' perspective, and having one-on-one discussions with patrons during intermissions. Conductor, educator, and music historian Leon Botstein founded TŌN in 2015 as a master's degree program at Bard College, where he also serves as president. The orchestra is in residence at Bard's Richard B. Fisher Center for the Performing Arts, performing multiple concerts there each season as well as taking part in the annual Bard Music Festival. They also perform regularly at the finest venues in New York, including Carnegie Hall, Lincoln Center, The Metropolitan Museum of Art, and others across NYC and beyond. The orchestra has performed with many distinguished conductors, including Fabio Luisi, Neeme Järvi, Gerard Schwarz, and JoAnn Falletta. We invite you to get to know TŌN and discover music in the making! Explore upcoming concerts, see what our musicians have to say, and more right here at theorchestranow.org. 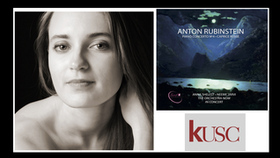 This CD, recorded live at Rose Theater at Jazz at Lincoln Center in New York, is the first release in the series of complete works for piano and orchestra by Anton Rubinstein featuring conductor Neeme Järvi and pianist Anna Shelest. Piano Concerto No.4, one of Rubinstein's best known works, is accompanied by Caprice Russe, a rarely performed one-movement gem. This week on KDFC: San Francisco, you can download the allegro from the Piano Concerto #4 of the important Russian musical figure, Anton Rubinstein.